“Training is important. We need to keep investing in people and training them to make the best of their ability,” says Scott Irwin, Head of Technical Training at TMD Friction. Irwin was promoted to the position in November. 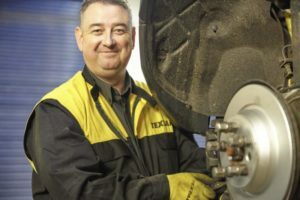 The BRAKE Report spoke with him to find out more about his new role and TMD Friction’s training program in general. “My vision is very clear when it comes to a training program on a global perspective, I want to develop various training platforms, whether that be for the mechanic, our suppliers, or even our internal teams,” Irwin said while chatting about how important training is when it comes to brand loyalty for both the mechanic and the supplier. The following discussion is lightly edited for clarity and flow. The Brake Report: Where is the TMD Friction training program now in terms of size? 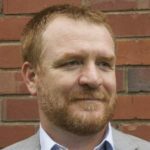 Scott Irwin: We’ve currently got 12 modules and carry out around 100 training sessions a year, but my role is to expand on that with a new training program across various platforms. Currently we have eight technical trainers globally, but again we are looking to expand on that in locations where we’ve got sales offices in different regions to reach a wider audience globally. TBR: What’s your job like on a day-to-day basis? SI: My days vary from pulling together new training materials, delivering presentations globally and training new members of the team to getting out on the road to meet suppliers and garages to see how we can help them from a technical perspective. We’re always looking at how we deliver the training, including e-learning programs and end-point assessment. As part of the training program, we work closely with the different departments within TMD Friction, whether that be R&D, our NVH or dyno experts, as well as the various sales teams globally. There’s a lot that goes into a training program. We continuously collect information when we’re out in the field and incorporate it into the training program to ensure we have up-to-date, standardized information globally. TBR: The trainers are out there in the field, potentially gathering important data. Does the information flow both ways? SI: Information flows both ways. 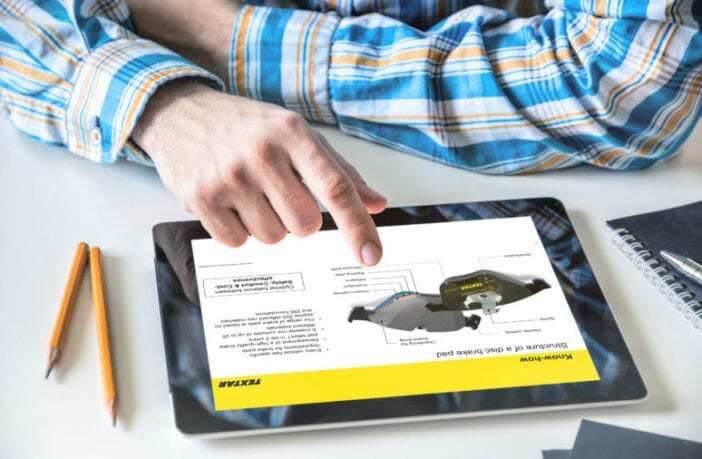 Obviously when our technical people are speaking to garages or delivering technical training, the feedback that we receive from our suppliers, the end users and garages, is very valuable. So that gives me the opportunity to go back to TMD, whether that be research and development, product management, or another group, and sit down with them and look at what we need to move forward as a business. TBR: Can you give me an example of how that feedback works? SI: We had one instance during a training session where mechanics were questioning a certain noise on a particular brake pad. The information we received allowed us to look at the pads more in-depth. Upon further inspection, it became evident that the pads were being fitted incorrectly. On the set application, there’s a finger-side pad and a piston-side pad, and they were getting it the wrong way around, causing noise issues. We used this information to go back to product management to see how we can make this easier for garages. We now put a directional arrow on the pad, as well as including the information within our technical training. TBR: Are there products that are particularly challenging from a training perspective, or is it the same across the board? SI: It’s not the same across the board. But it comes down to how we present it and what sort of training we have. Anybody can talk about a set of pads. But as a manufacturer — the leading global manufacturer — we go into it in-depth so that our suppliers and garages can really understand what makes us different. We can take them through the entire friction journey from the raw materials in the laboratory and new innovations such as the new Textar Q+ shim technology, right through to testing on the dynos and field testing. Anyone can deliver training on a set of pads. We go above and beyond to deliver the best possible training globally. Scott Irwin, TMD’s new head of technical training. And as the market leader in brake technology, we want to offer the best training packages in the industry for the global aftermarket. TBR: It’s training but it’s also education, in a broader sense. SI: That’s right, it’s education. Knowledge is power. TBR: At least in the U.S., there’s a real shortage of quality mechanics. Does that issue impact your training? SI: Not really. We work closely with awarding bodies, such as the IMI in the UK, and are looking at others worldwide to collaborate with. In addition to this, we also go into colleges to deliver brake training to instil best practice into them from very early on. By showing them how we operate as a manufacturer can show young mechanics the importance of choosing quality brakes. TBR: Do you get to go out and do some of these trainings, or are you stuck in an office to a certain extent with your new job? SI: No, I’m still very on the ground going out to visit suppliers and garages to deliver the training. Using my experience of liaising directly with our customers really helps me to develop new training programs, as well as being able to understand the issues that face them on a day-to-day basis. I like to get out into the heart of the garages to understand what requirements are needed from a training perspective. TBR: What do you enjoy most about training? SI: Passing on my knowledge. I’ve been in the automotive industry since age 17. I’ve also previously worked as a college lecturer for eight years working with young mechanics. So passing on knowledge and teaching best practice is something I’m very passionate about.